The controversy concerning invoices paid in relation to the main road works was addressed in a previous post. In this article we analyse the second important question dealt with by the action for information that GOB organised on Friday 9 February in front of the offices of the island local government, the Consell Insular. 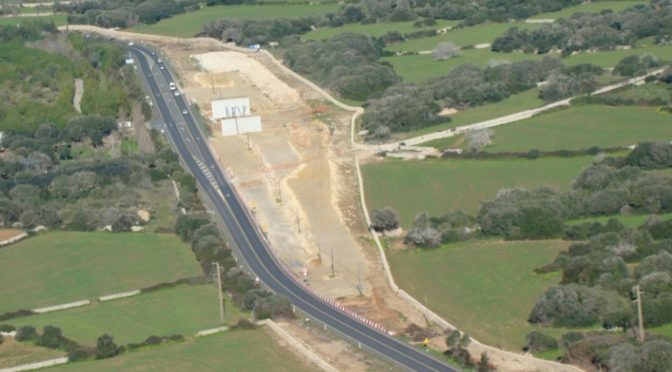 The public debate on the road came about at the end of 2012 when, after the Consell Insular put out to tender for the works to the part of the main road between Mahon and Alaior and were presented with 17 budgets. They chose one which did not have any work requiring double level roundabouts. Yet, the final budget presented to the public incorporated four huge double level roundabouts. In the weeks following the start of the works, now in 2014, the construction company stopped and demanded 2.5 million euros more. This slowed down the works and following the elections of 2015, the company accepted withdrawing the contract knowing that there would be no increase allowed on the budget. Since then the works that were completed were reviewed. From this it was noted that the bridge begun in l’Argentina had not observed the necessary drainage requirement. After some lengthy consideration by the Commission of the Environment there is now a change to be done in order to make the road at a single level. At the same time, a petition has emerged signed by different organisations (not suspected of extreme political views) asking for the bridge starting in Rafal Rubí to be revised. If the works are carried on as initially projected, the road will be less than 50 metres from one of the most magnificent navetas (megalithic monuments) on the north coast. The recent resolution by UNESCO on the candidature of Menorca Talaiòtica has raised the necessity to think very carefully of the surroundings of archaeological monuments and this is now the time to revise the proposed works on the road in that area. For these reasons, in the action for information, a demand was made for a timetable for the work to be done on the section of the road between Mahon and Alaior. A subject that some of the media have replaced by the invoice controversy but which in reality carries much more weight. Representatives of the Federació de Vesins (Association of Neighbours), of Menorquins pel Territori (Menorcans for the Land), of SOS Menorca, of the Plataforma pel diàleg a la carretera (the Forum for a dialogue on the road) and of GOB, had a meeting, after the action for information, with the President of the Consell and with the Councillor for Transport. The entire past programme was reviewed and a timetable for the future works was outlined. For June, it seems that the two most controversial points of l’Argentina and Rafal Rubí will have to be resolved. The object is that before the end of the year, there will be an approved project which will balance both security and the impact on the environment. The work must continue with the details as announced. On the part of GOB we will continue sending out information as and when there is useful news.